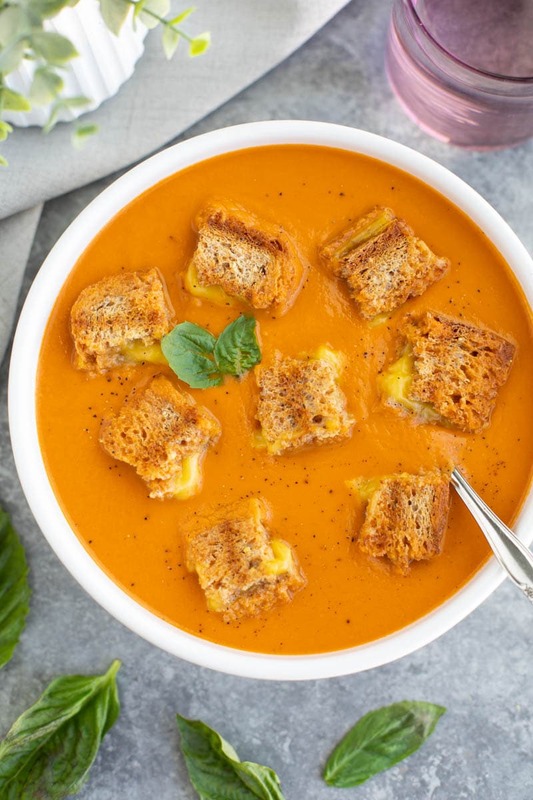 Classic tomato basil soup is taken to the next level with roasted red peppers and extra basil! Vegan, dairy-free. I always try to sneak some extra veggies into the meals that I make. Smoothies, pizza, salad, sandwiches, and this soup is no exception! Red peppers are super foods that are loaded with vitamin A, vitamin C, lycopene, and antioxidants. 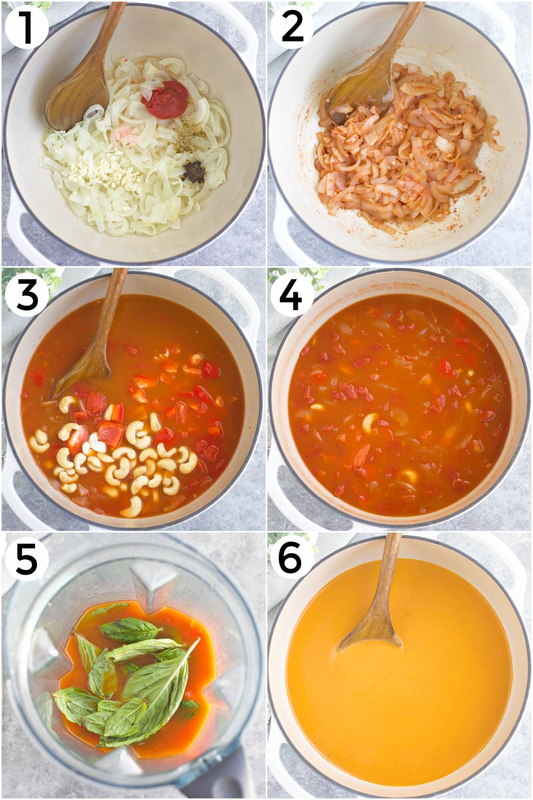 The red peppers really enhance the flavor of the soup and it blends perfectly with the tomatoes. You all know how much I love basil, I loaded this soup with it and it was delicious! What I really love about this tomato soup is the delicious flavor that develops from roasting the tomatoes, red peppers, onions, and garlic. The onions get the best caramelized flavor that makes my mouth water just thinking about it. Let the veggies cool on the pan before you add it to a food processor to blend it. The first time I made this soup, I tried to blend the veggies while they were still warm and my blender top blew off and I had tomato soup everywhere. Literally, everywhere! And all over me. You can try using a stick blender to blend the soup in the pot but I’ve found that using a hand blender won’t puree all the tiny pieces of tomato skin. A high-powered blender works much better. I also made a loaf of my favorite No-knead Whole Wheat Chia Bread to dip into the tomato soup. Crusty bread is 100% necessary when making tomato soup, I must have something to dip! Classic tomato basil soup that's taken to the next level with roasted red peppers and extra basil! Vegan. Put the tomatoes, onions, garlic, and red peppers on a parchment lined tray. Drizzle olive oil over the tray (make sure to drizzle a bit of oil directly over the garlic) and season with salt and pepper. Toss to combine. Roast for 30-40 minutes, or until the tips start to turn brown. Remove the tray from the oven and let it cool completely. Pour the mixture into a soup pot. Stir in the soy milk, cover it, and bring it to a low simmer and cook for 20 minutes, covered. Serve with grilled cheese or slices of crusty bread.